Go ahead, change your own air filter — your wallet will thank you. You don't have to be a car expert to perform some of your basic needed maintenance. There are several simple tasks you can take on, as long as you're willing to use a little elbow grease and buy the parts yourself. Most auto parts can easily be purchased either online or at your local chain auto parts store. Here are three quick do-it-yourself tasks that your car — and your wallet — will thank you for doing. The air filter uses a paper element to clean the air going into your car’s engine. Periodically, it becomes clogged with dirt and debris and has to be replaced. Mechanics often suggest replacing it when you bring your car in for an oil change (for an extra $20 to $50) but doing it yourself is a snap. Your owner’s manual will tell you how often the air filter needs to be changed. Purchase the right air filter. At the auto parts store, or when ordering online, you should look up the part number required for your car. You will need to know the year, make and model of your car and sometimes the engine size (four-cylinder, V-6 etc.). Locate the air filter. Open your car’s hood and look for a large rubber hose leading to a black plastic box. This box holds the air filter and has several clips securing the top. Remove the old filter. Pop open the metal clips that hold the top on. Sometimes you need a screwdriver to pry the clip open. When you open the box and remove the dirty filter, note which side is facing down and how the filter is positioned. Install the new air filter. Place the new filter in the box making sure it is positioned correctly. If the box doesn’t close easily, the new air filter isn’t in the right position. Rotate it, or reverse it, until you can close the box and snap it shut. 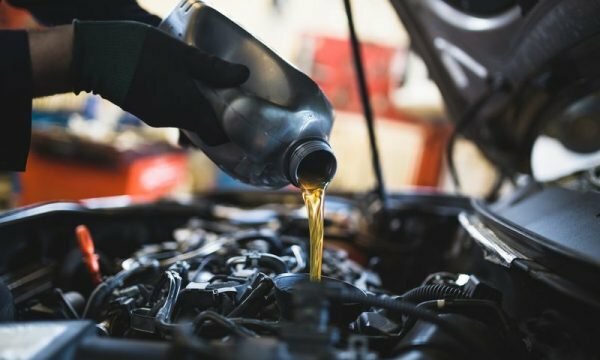 Oil lubricates your engine parts to reduce friction, prevent wear and prolong your engine’s life. Check the oil level once a month or before you go on a long trip to keep your engine purring. Check your owner’s manual. This will tell you if your car engine should be cold or warm when you check the oil level. It will also tell you the type of oil your car uses and the location of your oil dipstick. Locate the dipstick. The dipstick will have a circular ring on top that allows you to grip it and remove it. Many modern cars have a pull ring that is brightly colored plastic to make it easy to identify. Pull out the dipstick. If the engine is hot, be careful not to touch any other parts. Loop your finger through the ring and pull up. Wipe the oil off of the dipstick and then reinsert. Then pull it back out once more. Check the level and condition. Dipsticks usually have two lines to indicate the minimum and maximum oil level. Look to see that the oil is between these lines. Also, make sure the oil is brown or black. If it is a milky white, it may mean coolant is leaking into the engine. If so, immediately take your car to a mechanic. If the oil is below the add line. Purchase a quart of motor oil recommended in the owner’s manual. Find the cap on top of the largest part of the engine, likely labeled “oil cap.” Unscrew the cap and add small amounts, rechecking the oil level on the dipstick. Visibility is crucial for safe driving, so replace your wipers if you notice them leaving streaks or smears on your windshield. You might also hear screeching if the rubber has dried out, which is another sign it’s time to change them. Check the connector. There are two types of wiper blades: those that use hook or pin connectors. Consult your owner’s manual or just look closely at your current wipers before you buy new ones. Measure the wiper blade. Some vehicles require different sizes for each side. Also, many SUVs now have a rear wiper that will be yet another length. Measure each of the wiper blades. Purchase new wiper blades. At the auto store, buy wiper blades that are the correct length and have the right connector. Removing a hook wiper blade. Raise the wiper arm so it is perpendicular to the windshield. At the point where the wiper blade and metal arm connect, there should be a small plastic locking tab holding it in place. Press the tab to release the wiper blade. Slide the blade down toward the car to remove it. Removing a pin wiper blade. If your vehicle uses the pin style connector, raise the arm. Look for a plastic tab below the wiper blade. Pull up to release the wiper blade. Installing the new blades. For hook blades, slide the new wiper blade into position below the hook and lift up until you hear a click. For pin style wiper blades, lift the tab allowing the pin to be inserted into the hole. Release the tab and the blade will be locked in place. Lower the wiper arm. A strong spring holds the wiper against the windshield so be careful not to let it snap back against your windshield. If you want video instructions for these tasks check Youtube.com or automotive forums.